Tube and solid-state amps connected to same speakers - how to toggle? With the improvements in streaming and DAC technologies, I've got what's likely a very lame question. I'd like to power my Tyler speaks with both my tube amp and precious Bedini sand amp -- obviously not at the same time. For background music and TV watching, mostly streaming, I want the sand-amp connected and running. For a pure lights-out listening, or a particularly well-recorded movie, I want my tubes. I have a well-capped Don Sachs pre-amp (souped-up SP14) with two outputs on different caps, so impedance disparities are not at issue. Sand amps can't tolerate a short on the speaker outputs anymore than a tube amp can be run without a load. I want to be able to toggle between the s/s and tube amp. Where would you put the switch, and what type of switch would you use so neither amp is put in harm's way or some sort of new noise encouraged? Thanks for any sage guidance here. Re: Tube and solid-state amps connected to same speakers - how to toggle? But it sounds like a risky proposition if someone besides yourself tried to operate it. 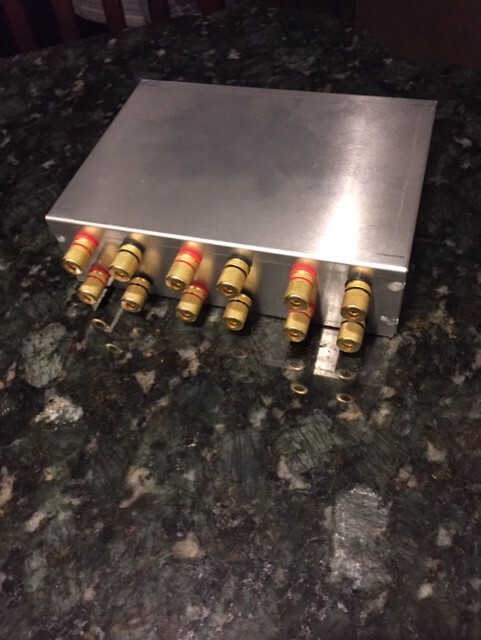 They do make 2 in, 1 out RCA switching boxes. But I'd be damn careful one was completely off before turning on the other, and never ABing them while both on. I'm thinking of using one on my SP14 separate outs to my multi-speaker selector. Easily done, just arrange the switches on the speaker leads so that the active amp goes to the speakers and the inactive amp is put into a suitably rated dummy load. Ideally the inactive amp should be either at zero volume, switched to an unused input, or switched off so that you are not wasting power into the dummy load. 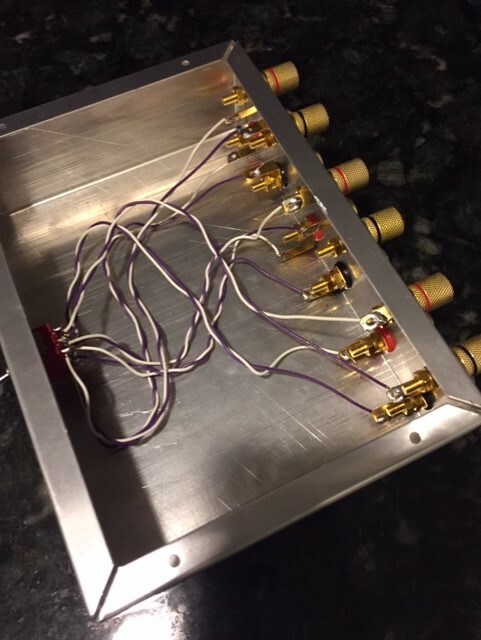 Modern SS amps are tolerant to no load conditions and I have seen another post on this forum regarding a permanently connected load to the Tube amp to at least limit the spikes on the OPT primary if the speakers are disconnected. Once I have completed my new workshop/listening room i'll be in the same situation regarding switching. After all electricity is expensive here in the UK and the last thing I need is for the VTA to be heating the room when I only want background music to fill the workshop. a) You wish to be able to toggle between two amps. b) It may come to pass that both amps will be "on" at the same time. c) It may come to pass that both amps will be receiving signal at the same time (this is the 'Kicker' in the equation). d) You wish to do this seamlessly. Irrespective of type, amps do not like being shorted or having input but no load. Irrespective of type, amps do not like being back-fed via the speaker outputs. I would be glad to send you four (4) 50-watt, 6-ohm wire-wound resistors for dummy-load purposes, which in a brute-force way will address one aspect of all this. A "master switch" consisting of a 4-pole NC/NC device that will switch between two (2) inputs to one (1) Output, putting the 'out' amp into the dummy load. If I am reading the product literature correctly (NO guarantee of that), you will need a 4-position switch. One that will handle sufficient current will not be cheap. I am seeing a range up to $120. CALL the supplier (Newark, Mouser, Digikey) and speak to a human being to be sure you are getting what you want. A standard multi-speaker switch from there to match the speaker to the connected amp and/or handle multiple speaker options. Maybe. I am thinking of four (4) dummy load resistors as I am seeing that one switch that will toggle between two amps and a single dummy load/single output gets complicated, but they do, certainly, exist. There are other solutions, I am sure. SS (or tube) amps do not mind a high-impedance load, so, depending on your speakers, you could leave say.... 20 ohms across the amp outputs at all times. Let me puzzle on this some more. I had looked into that a while back, and yes, as Peter W points out, it can be done, BUT I found the whole thing to be too complicated, 'asking for it' if ANYTHING should go astray....in my humble opinion, it aint worth the effort. Leave your beloved Bedini's in your study!! ;-) and leave your beloved Tylers connected to your tooooobs!! I hope all are sitting down when reading this. There are some steampunk aspects as well as it covers all the bases, at no time leaving an amp unloaded, even in the 'neutral' position. Far heavier than the need, but much cheaper than other solutions I found. And a very positive contact in either aspect. Will also be a conversation starter. 4 x 25 - 50 ohm, 25 - 50 watt resistors. The speakers are connected to the center-leads of the toggle - meaning that they are connected to an amp only when the switch is closed to one side or the other. Each amp is connected to one side of the toggle, with a resistor in parallel with each channel. So, when that side is 'open', the amp 'sees' the resistor as the dummy load. When that side is 'closed' the speakers are in parallel with the dummy-load resistor. An 8-ohm speaker in parallel with a 25-ohm resistor gives a nominal 6.06 ohm impedance. A 4-ohm speaker.... 3.45 ohms. A 4-ohm speaker.... 3.70 ohms. The elegant aspect of all this is that even if the knife-switch is not "Made" to either side, the amps each see an appropriately safe load. It would be perfectly acceptable to add some resistance in series with the speakers to prevent loading below a specific value. But that would also quiet things down some, and add the expense of an additional high-wattage resistor. Most amps are stable to around 2 ohms or so continuous anyway, many well below that - as long as the load is active. Do connect to the 8-ohm tap of the tube amp, however. Peter, Holger, et al, thank-you for your thoughts. Peter has stated the scenario I envisioned; Holger the risks. Even puzzled-out well, I am extremely leery of the possibility of *either* human error or mechanical failure (or worse, both) taking out, in the blink of an eye, several thousand hard-earned dollars worth of amplifier, or somehow shooting a healthy dose of DC down the speaker lines and frying a voice coil or three. FWIW, John Bedini's s/s amps could withstand a direct short across the speaker outputs. Not something to try at home, but I saw John actually do it with MY amp and a very hefty signal going in on his bench in Coeur d'Alene. I suppose Mac's autoformers could handle such an abuse for a short period of time, but I never saw Gordon Gow pull that stunt in one of his traveling road-show "clinics." It just ain't done. That, and given all the cautions I've read about running a tube amp without any load whatsoever, is the reason I posited the question in the first place. Switching speakers tied to the same amp is one thing, but switching dissimilar amps mid-stream is quite another. There's gotta be a way, still, shy of doubling-down and buying another set of Tylers so each pair is dedicated to its own amp, thus imperiling marital serenity and taking out a 2nd mortgage . . .
*Again, I wrote all this before Peter's 2nd response* but didn't want to toss away a half-hour's worth of typing. then there is also a reason why such an animal is pretty much unavailable commercially...the implications and warranty claims could be horrendous! erhard-audio wrote: then there is also a reason why such an animal is pretty much unavailable commercially...the implications and warranty claims could be horrendous! As much as I've thought about this topic, I think the best answer is to wire to and unwire each amp as needed, or just have 2 systems. I really hate crackle and smoke. the old Dynaco MK3 had a 680 ohm resistor tied across it's speaker outputs permanently, I imagine to prevent accidental problems with no speakers connected. I've been known to put a 100 ohm resistor tied across the outputs of ST70s for the same reason when I have them on the bench. 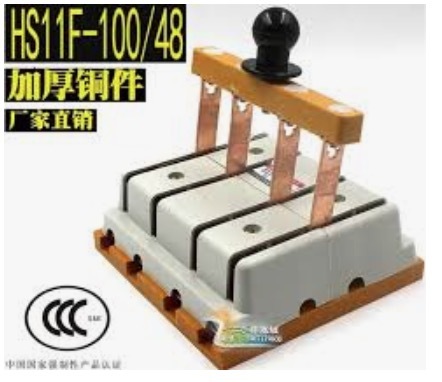 What would tip me over would be to find a great big brass 4pole double-throw knife switch of the type I used to see in tugboat engine rooms that toggled between the auxiliary alternator (usually an Onan strapped to a GM 6-71 and the main-engine driven generator/alternator. Ma Bell used to have similar switches and the brass blades were about a quarter-inch thick, so no worries about amperage overloads then wire it up as Peter W suggests with the appropriate resistive loads. Would just need to take off my metal wrist-watch when throwing it, which is force of habit around anything that plugs into the wall anyway. (I don't even change the Volume level if I'm wearing jewelry. A lot of the silver mines around here switch 440DC so maybe a little scrapyard research and Brasso would do the trick, although a lot of that lovely stuff grew legs when copper hit $4/lb a few years back. To paraphrase Robert Duval, "I love the smell of burning Bakelite in the morning." I've built a number of switching boxes for just this purpose. 20 amp capacity. One for each channel, amps are never connected together. Just don't leave tube amp unloaded. deepee99 wrote: What would tip me over would be to find a great big brass 4pole double-throw knife switch of the type I used to see in tugboat engine rooms that toggled between the auxiliary alternator (usually an Onan strapped to a GM 6-71 and the main-engine driven generator/alternator. Ma Bell used to have similar switches and the brass blades were about a quarter-inch thick, so no worries about amperage overloads then wire it up as Peter W suggests with the appropriate resistive loads. Would just need to take off my metal wrist-watch when throwing it, which is force of habit around anything that plugs into the wall anyway. (I don't even change the Volume level if I'm wearing jewelry. There aren't a whole lot to be had. BBQJOE, got a link to them? Price? That would work. deepee99 wrote: BBQJOE, got a link to them? Price? That would work. Probably not the best source in the world. I looked around ebay for something more antique/steamy. Not much there, but Amazon does have one a little more old school. I gave up on trying to do this dance with a switch and I just have separate speaker cables running to my speakers from various amps. I'm now in the habit of checking which cables are hooked to the speakers before I turn on an amp. The speaker cables are different and easily identifiable by amp. One could make a box with control relays in it and a master power switch. The master switch is off then no power to either amp.When the master is powered on select which amp you want on with the toggle switch, you'd select one relay or the other to output (120 vac) to different sides of a receptacle to power the amps. This would assure only one amp would be on at a time. You could do the same with the speakers wires into another set of relays so when amp (SS) is on, the speaker wires from it, would passed through to the speakers, the (tube) amp speaker wires would be sitting open to the speakers, but no way to get power to turn on accidentally and vice versa when the toggle switch is reversed. The speakers would only see the amp output of the selection of the toggle switch. This is from a pure electrical standpoint, I don't know when the speaker signal passes thru a relay contact if it would pick up any noise from the coil of the relay or the contact affect the signal. I just know control circuits. 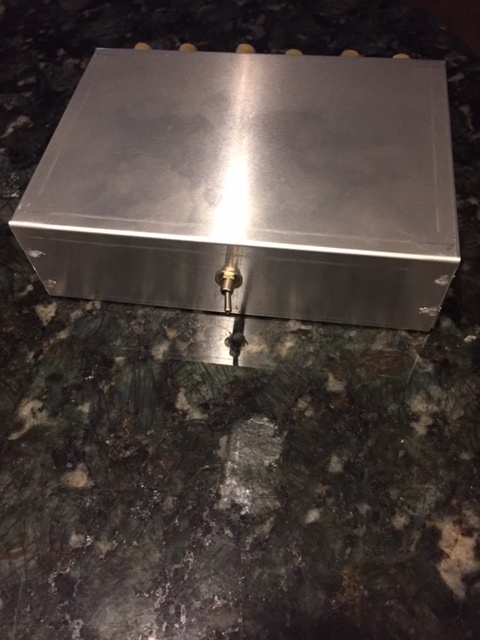 I just made this little device about 2 weeks ago for my son's basement system. He has an old set of B&W 602s of mine, and uses them with both his home theater system and his Dynaco ST-35 that we built together some years back. The box, as you can see, uses essentially the same thing as the previously depicted knife switch.....only this uses a mini-switch. That knife switch is like over-kill to the max IMHO. The mini switch is good for over 5 amps at 125 V. I don't know too many amps that would kill that switch! Anyway, it's use presumes 2 things: 1) the user knows what he (or she) is doing with it! and 2) that there will NEVER be two amps 'on' at the same time. I have this same basic set-up on my shop work bench......and use it between my 'daily driver' amp that I listen to when I work.....and a set of 'test' leads that I can use to evaluate any work in process. Been set up for over 10 years like this now......and 'no problems'!! I'll note that this set up maintains discrete ground connections to speakers with no 'common' connections on any wires. All the speaker jacks are isolated on the chassis, and the switch itself is the DP4T....so works great!! I think the total cost was around $25 or so. I bought a Niles DPS1 from eBay in 2017 to switch between my VTA120 and AVR amps. Works great (although I paid less than 1/2 what the link is selling for). It's been posted several times here on different threads, and I'm surprised it isn't here too, but you must switch the amps BEFORE turning on the VTA so it carries a load when starting up. Open circuit tube amps are prone to failing.